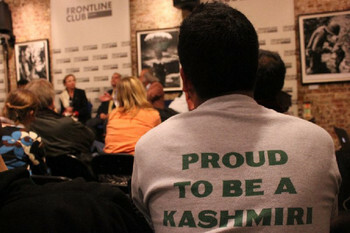 The club hosted an animated discussion last night on the controversial issues surrounding the future of Kashmir. Chaired by author and broadcaster Victoria Schofield. A divide occured when, Times of India journalist Ashis Ray, went on to defend India’s administration of Kashmir. During the partition of former British India, the Maharaja of Jammu & Kashmir had to choose to join either Pakistan or India, reminds Schofield as she tries to bring perspective back into the discussions, a new section has arisen within the Kashmiri population that wants independence. Khan reiterated this point later in the discussion as he outlined the importance of raising international awareness of the situation in Kashmir. Subash Chopra saw a solution through the relationship between India and Pakistan as he believed that a good relationship between these two countries could lead to a positive outcome for Kashmir. The discussions reflected the pessimism a lot of people feel when approaching this ‘intractable conflict.’ Despite their disagreements on how to resolve the conflict, there was agreement at least that the political dicussions had moved on since the outbreak of violence 1989 but that a definite solution was still not on the horizon.